#1: OMG we finally have our first podcast for everyone! Welcome to GFT! Meet your hosts Kat La Forgia a Masters in Marriage and Family therapy who works in Pennsylvania as a Family Home Based Therapist. Lea who works in foster care and has her Masters in Media Psychology. This episode we are introducing ourselves and talking about what we will be discussing as we continue in this podcast; as well as Viral Media and why and how it affects families. 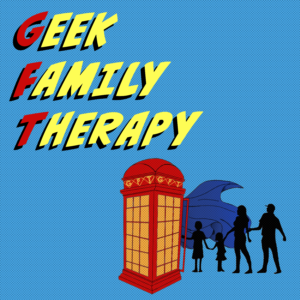 Welcome to Geeks & Family Therapy! So my first post regarding a podcast which will go live later this week. My name is Kat, I will be co-hosting a podcast with my friend Leanika, called Geeks and Family Therapy. I am a family therapist in Pennsylvania, working towards licensure, as well as becoming a certified Ecosystemic Family Therapist. Leanika received her Masters degree in Media Psychology from Touro University in 2016; which is a new branch of psychology which focuses on the relationship between human behavior and media; which includes social media. Currently, she works as a case planner for a non-profit foster care program in NYC. But hopes to focus her skills working in social media and consulting. Lea particularly enjoys working with the cosplay, gaming and comic communities. What will Geeks & Family Therapy be about? Geek culture’s influence and impact on families; its presence and use in family therapy as well how psychology is used in geek culture and media. Both Lea and Kat will discuss popular culture and its impact on families. How psychology is utilized to influence consumers, when purchasing toys, games, books, movie tickets, etc. As well as how media, pop culture, and geek culture can be utilized in psychology and therapy.